Bitten by Romance - Book reviews and more : October's Paranormal romance characterfest with Liz Strange and giveaway ! 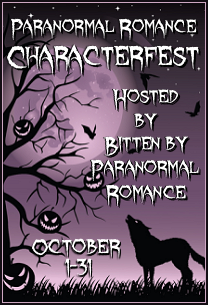 October's Paranormal romance characterfest with Liz Strange and giveaway ! 1. Please tell us a little bit about your background. My full name is Giovanni Alejandro Ruiz y Castillo, and I was born in Catalonia, Spain, in 1712 to a moderately wealthy family. I had a traditional upbringing, belonged to the Catholic church and had many brothers and sisters. When I came of age I moved on to France to study art. 2. How did you become a vampire? While in France I unknowingly attracted the attention of a very old vampire. One night, after a secret meeting with a young woman I had fallen in love with, he came to me. I had no idea what he was, and he took me with no warning and no chance to make the choice for myself. He left me soon after. 3. I’ve heard about your recent ordeals with the Desmarais, can you give me some details? Ah, the Desmarais. It was one of their own that I had fallen in love with as a mortal man, a young, sweet girl named Seraphine. Because of the terrible circumstances of my change I was left without guidance and was at first unable to control my blood lust. I killed her and her brother, acts that started a centuries old vendetta against me and other vampire-kind. After three hundred years, and many advances in their knowledge of vampires, the Desmarais caught up with me. Instead of killing me though, they kept me for two years, starving me and torturing me. I was saved by accident when Rachel and her friends came to destroy the group, finding me in one of their compounds. I am much better now, but will never fully recover from everything I went through. 4. There have been many rumors, but could you give an inside scoop into what happened with Harshika? Harshika, Mother of all Immortals, called her offspring together recently. She was not happy with how the race as a whole was acting, and tried to force us to submit to her ways under threat of destruction. I cannot give away too much of what happened, but I will say that the threat has been averted and immortal kind have come through the ordeal the better for it. 5. What are you feelings about the current state of vampire kind? I am pleased that we are making strides to get past the old ways of suspicion and solidarity. I think as a group we are stronger. Don’t believe everything you read or are told, much has been made up and exaggerated over the years. Some of us are really quite lovely—others are not. Liz is offering 2- a copy of Born of Blood and Retribution and The Embrace of Life and Death, for giveaway. These are eBooks so international is welcome. Please leave a comment or question to Liz or her character Giovinni, along with your email. Great interview. My question would be for Giovanni: Did you ever have any other contact with the vampire who made you? Do you know what's become of him? Thanks so much Liz for taking the time to do this guest post and offer a giveaway. I love your books and would love to win. Giovanni Can you tell us how things have changed since you been turned? Great post. Liz is a new author for me and can't wait to check out her books. Thanks for the chance. Well, to answer the two questions posted so far-As for if Giovanni has had any contact with his maker? The answer to this plays out in the first book of the series, My Love Eternal. And many things haved changed since he became a vampire, most importantly how other immortals interact with one another. I really enjoyed the interview! The books sound like a must read! that is an AWESOME book cover :) did u pick it yourself? Giovanni, you mentioned that due to the lack of guidance, you were initially unable to control your blood lust. Did you eventually receive guidance or was the control the result of the passing of time? This is the first I have heard of this series. It sounds like one I would really enjoy! Esp. Giovanni! This is a trilogy, do these books have to be read in order? Giovanni's control over his blood lust came about through his own dedication, and some close calls. Yes the books should be read in order. Thanks for all the comments and questions. What happened with the woman he had the affair with before he turned? Did he end up still seeing her afterwards? Great interview. Thank you for introducing me to another new author/series. I'm adding it to my TBR list. Giovanni sounds like someone I'd like to know better! Great interview! I loved the brief descriptions, just enough to whet my appetite! Can't wait to get my hands on the series! Was there a specific event that got you started thinking of this new world you created? Either way, can't wait to read it! Great interview. My question is have you lived in many different places since you've become immortal and if so where did you enjoy living the most. This was also a very interesting character interview. This book will go to my TBR list! Question: if you could change anything from your long life, what would it be? Thank you for the great post! I would love to read these thank you for the great giveaway! I have alot of new book to add to my reading list after all the great posts!